get close to the Earth on December 12. The small asteroid, consisting of two parts of 4.6 km and 2.4 km can not harm our planet. Asteroid Toutatis 4179 was named after the Celtic god. This asteroid has an irregular form, and belongs to the category of Apollo. 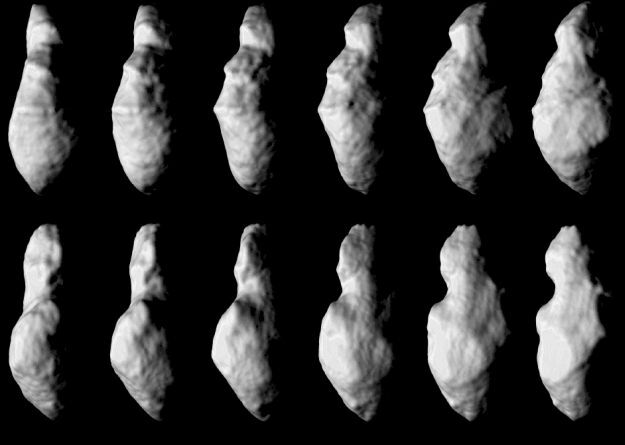 Asteroid Toutatis has diameter 5.4 kilometers, and the rotation period is 176 hours. At the closest distance the asteroid approached the Earth in 2004. This year, the asteroid must pass by our planet at a distance of 6.9 million kilometers from Earth. This is 18 times more of the distance between Earth and moon. The approach of the asteroid with the Earth, the scientists want to watch how he moves. in fact form an asteroid rather strange: it is long and very narrow, with two clearly marked in fractions of irregular size.